Councilor Peña believes a multicultural law enforcement agency made up of men and women from our neighborhoods is more easily able to understand and connect with the diverse issues in our community and can be more effective at policing. 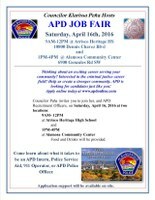 Along with recruiting potential candidates as police officers, Albuquerque Police also will accept applications for Police Service Aides, Transport Officers, and 911 operators. There are also opportunities for high school youth to become an Albuquerque Police Department intern, where they can learn more about careers in criminal justice. For more information please call (505) 768-3127 or email [email protected].